I have not done a blog post in three months because I have been extremely busy. First of all, I took the Venture School class through the Univeristy of Iowa. That class ran from March through the middle of May. It was very intense and I may have called some of you on the phone to do customer interviews for that class. Thanks to everyone who helped me with that. I learned so much that I am still trying to figure out what to do with all this knowledge. I have a million new ideas but it will take some time to implement all of them. I created a number of new products in the last several months. These were a combination of custom requests and some new ideas that I had. I have featured them in social media and in other places on this web site, but not in this blog. Back in December, there was a convention for fans of the TV series Outlander. I did not know much about it, but I quickly learned. I was a vendor at the convention, and as part of that I designed this Outlander-inspired Key Ring. There are three versions of it – a nickel-plated steel version, a raw silver version, and a silver version with dark patina. After the convention, I designed a Scottish Thistle Ring, which is my interpretation of how the ring is described in the book. I also took the Thistle from that ring and modified it so it could be worn as a pendant. Next I designed this new Braided Celtic Knot ring below. This is meant to look like the ring in the film The Fountain. You only get a brief glimpse of it a few different times in the movie, but I think this is pretty close. It is one of my favorite movies and the ring does have special significance in the film. Finally, there are two new pendant designs. The first is just a variation of the Amulet of Mara pendant. Instead of a cabochon in the center, I made a version with prongs to hold a chaton, which is a crystal that is cut very similar to a round-cut diamond. The other new pendant is the Four Elements pendant. This was a custom request made from scratch. 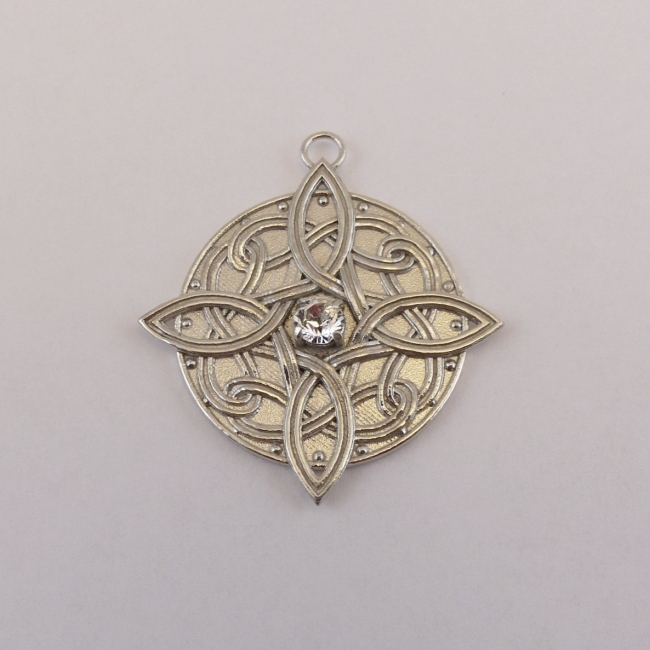 I took a Celtic knot I have used in one of my other pendant designs and modified it, so it divided a circle into four sections. Then I put a symbol for each of the four ancient elements (Earth, Air, Fire and Water), and a colored crystal. I then used liver of sulfur to darken the piece. Finally, I polished away some of the dark patina to make the Celtic knot and symbols really stand out. I did another photo collaboration with Local Pittsburgh magazine photographer Julie Kahlbaugh (Instagram: @julieanne514) and model Alicia Kozak (Instagram: @itsaliciakozak). I had previously collaborated with Julie last year. Once again, the photos they created were amazing. In addition to this web site, I also sell on Etsy. You can save 10% at the D&O Celtic Jewelry Etsy shop with the coupon code “summer10”. This promotion goes through the end of June.